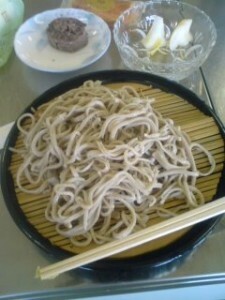 My toshikoshi soba for the end of 2010- there was a one hour wait to get these noodles- but WELL worth it! After sunset on December 31st, families all across Japan will be sitting down to eat buckwheat noodles, which for the occassion are called TOSHIKOSHI SOBA ( literally, passing-from-one-year-to-the-next-soba). This custom became widespread among the merchant class sometime during the Edo Period ( 1600-1868) . It was obviously a convient FAST FOOD, for the busiest time of the year, and this might be a major reason why this custom has remained so universal in Japan ( though there are some regions where other Toshikoshi dishes are eaten, and I might add that buckwheat allergies are not rare, and obviously families with sufferers would opt for something else). However, just as with everything else that has become a staple of tradition in Japan, there is a symbolic significance in eating these noodles on New Year`s Eve. In fact there is more than one! First, noodles are long and represent long life. 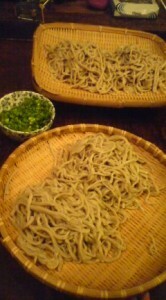 Second, buckwheat noodles break easilly, representing a clean break with the old year. Third, buckwheat noodles are thought be usefull in cleaning out the digestive system, and thus give the body a good end of the year cleansing. Fourth, in the Edo Period Japanese goldsmiths used buckwheat dough-balls to gather up gold dust from the floor or table ( which was then separated in water). Buckwheat therefore became a symbol for attracting gold ( wealth). We can thus see that it is NOT only because they are convenient and delicious that eating soba on New Years Eve has become such a popular tradition! It is also important to note that in the Edo Period, that is before the Japanese adopted the Western-Style calendar, eating toshikoshi soba actually took place as one year changed into the next. This is because according to the traditional Japanese calendar, one day ends and the begins at SUNSET. Thus, the New Year would ring in the evening- just about dinner time. In fact, the last sunset of the year also used to come quite a bit later, because according to the old calendar New Year`s was celebrated sometime in February ( as Chinese New Year still is). You can find soba on sale at any supermarket or even convenience store for tonight. Of course, getting your noodles from a good soba restaurant is even a better idea, as they will probably be more delicious. I will pick up mine at ICHII, in Konda, Tsukuba. 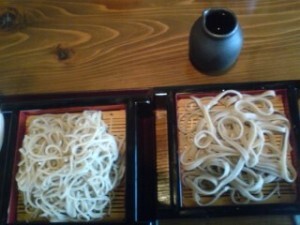 (Also remember that buckwheat noodles are presented to neighbors when moving into a new house or apartment. One reason for this is that the word SOBA also means NEXT TO. Another, is the fact that noodles are long and slim- a way of saying, we are now close to each other, but lets not be THAT close! You ate the soba cold? I first ate the toshikoshi soba topped with tempura, cooked by my mother-in-law.